Frances with Cóilí Jakie - he will not go to court . .
Cóilí Jakie is due in court to face charges of polluting the river, but he has no intention of going. Sorcha is concerned his absence will be frowned upon, and pleads with Adam to ask Frances to intervene. Adam reluctantly does so, but soon regrets it, when Keanes takings go missing. A photo of Jason, and a new lady friend appears in a magazine. Jason's fidelity is questioned. Katy has no choice but to explain that they had already broken up, and there was no cheating involved. Berni's romantic Valentines dinner is interrupted by an unexpected visitor. Berni attempts to hide all remnants of romance from her guest, and does not divulge that Briain, is in fact her boyfriend. 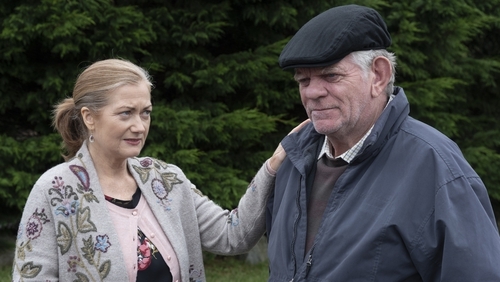 Frances offers Cóilí Jackie a job in the Ionad Pobail, to help pay his court fine, but Cóilí Jackie refuses. Cóilí Jackie meets Malachaí for financial advice, but he is not at all happy with his suggestions. Will CóilI Jackie have to reconsider Frances job offer? Dee is disgusted when she learns Mack invited Katy over for dinner, and alludes to his and Katy's previous dalliance.